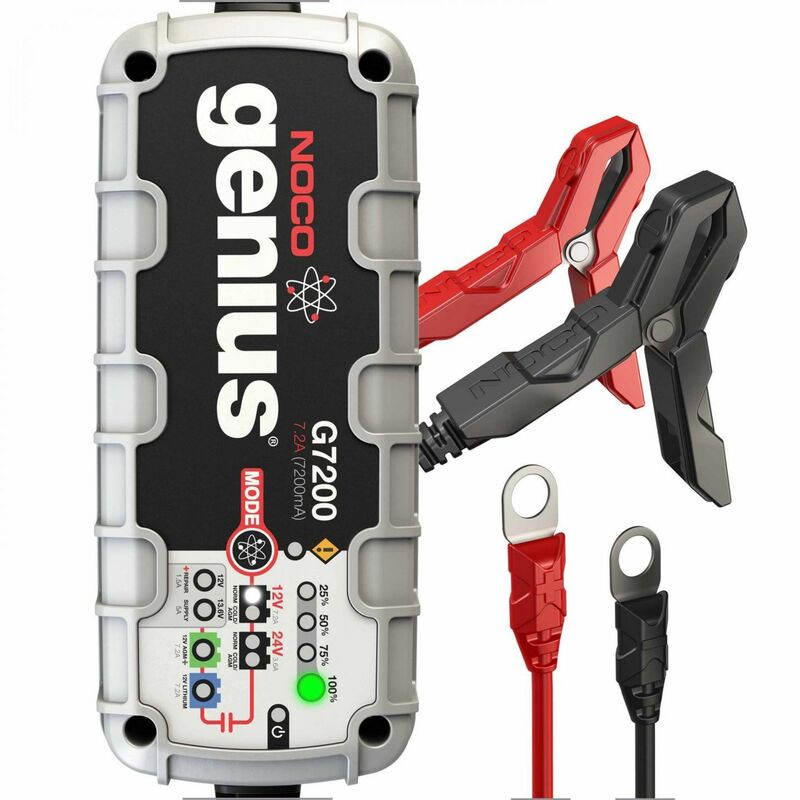 The G-7200 Smart Charger by Noco is a 7.2 Amp battery charger designed to charge and maintain small batteries. This is a perfect charger for extreme situations and equipment. Use with confidence on midsize and large vehicles including trucks and RVs. Noco uses true Switch mode technology in this super efficient line of chargers. This charger has a noise factor of 150 mV, less than 50 db. This charger is a true multistage, microprocessor controlled charger that will not overcharge your batteries, ever. Also incorporated in this unit is the ability to adjust to low voltage input, which could happen if running it off of a generator or a very long extension cord. This charger can operate off of as low as 85 VAC and all the way up to 130 VAC, and will withstand voltage surges up to 200 VAC. One of the most unique features about this charger is that it is capable of charging both 12 and 24 volt batteries. It also is capable of bringing a dead 12 volt battery back from as low as 2 volts. The G-7200 charger is a fully microprocessor controlled charger that is perfect for batteries in the 14-230 amp hour ratings. It also can effectively maintain larger batteries such as RV batteries. Lithium setting is for charging 12-volt lithium-ion batteries, including lithium iron phosphate. Rated 5.00/5 Stars from 5 customer reviews. Do you own the G-7200? Please, tell us what you think about it. It helps us provide you with better products. Please note that it may take up to 72 hours for your review to appear. Pros: As described the range of utility is uncommon, in my experience, for medium range batteries. More typically you would need at least two alternatives to capture the full range of applications the Genius 7200 provides. As a sailboat owner my house battery takes a beating in deep-cycle counts. Recovery from below 10.5 volts is typical, though obviously not recommended for life cycle of the battery. The Genius works like a charm on this wet cell. When it comes to my electric mower the switch to an AGM type twin battery 24-volt system is nothing more than plugging it in and selecting for the application. If the car won't start, bingo again. The most important maintenance tool I've bought in a long time. Pros: Very smart with great indicators. Connect and forget. Runs nicely off Honda EX1000 generator. All weather - can get rained on. I use this to keep my RV battery topped off. When dry camping, this keeps my RV battery charged AND covers the current draw of my heater fan and lights. I\'d buy another in a heartbeat. Real test will be to see how long my RV battery lasts being constantly hooked up to this charger. Cons: Didn't find them 20 years ago !! Reach out to the public ! Pros: Been using wheeled manual chargers for years now despite going through a few of them of different brands. They don't seem to last and they are dangerous. i.e. forgetting to turn them off and overcharging. I remember having to drive back to the shop on occasion because I didn't remember if I turned it off or not. Once, I was charging a battery in a vehicle on the show room and got busy and just forgot about it. By the time I remembered the show room smelled like sulfuric acid and I could hear the battery boiling as I walked up to it. No more worrying with this little guy. You just install it and forget it. I leave it on overnight most of the time. Whenever I have a job that will take time on a customer's vehicle I hook it up just to leave it better off than I found it. I basically look for any reason to use it. Cons: If any...the clamps could have more spring tension.